Open to all girls in Weston Middle School. Sessions are from 2:30–4:15pm on select Tuesdays from October to May (generally 1 session per month). Total of 7 sessions, plus 1 Field Trip to CT State Capitol, and 1 Campaign and Election event. Cost: $175 per participant. Need-based scholarships are available. Program will be co-facilitated by Gayle Weinstein, former First Selectwoman,and Elise Major, former Board of Education Member. 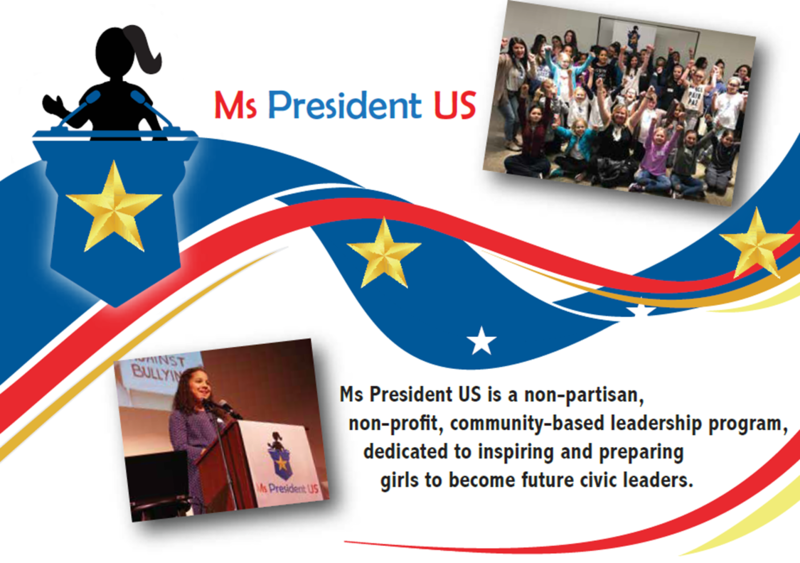 Enrolled girls will learn civic responsibility and campaign skills by working in teams to create a campaign for “Ms President US” of their town. In the final session, the girls will give their campaign speech and a presentation. Community leaders and school officials will determine the winner.The winner will be invited to appearances throughout the year. This program is Girl Scouts badge eligible. High School girls serve as Mentors, facilitating each session, and supporting the participants throughout the program. Room B-10. Please note: The date for the trip to the State Capitol has not be confirmed, as we will join with other Ms President US groups.